The Centers for Medicare and Medicaid Services (CMS) have just made public a must-read analysis of preferred pharmacy networks in Medicare Part D Prescription Drug Plans (PDPs). Read it here: Part D Claims Analysis: Negotiated Pricing Between Preferred and Non-Preferred Pharmacy Networks. On average, preferred pharmacies had prescription costs that were about 6% cheaper than those of non-preferred pharmacies. The four biggest plans, accounting for 93% of claims, had average savings of 8% at preferred pharmacies. Surprisingly, preferred pharmacy costs were higher in five of the 13 plans. These plans accounted for only 4% of total claims, so this unexpected result didn’t affect the overall savings. By demonstrating cost savings, the new CMS report will accelerate the growth of preferred pharmacy networks. Manufacturers can start getting ready for these networks by reading Pharmacy Benefit Networks: The Big Squeeze, my article from the May 2013 Pharmaceutical Executive. PBMs, which favor preferred networks, cheered the CMS-documented cost savings. Independent pharmacies, which oppose these networks, touted problems with the five higher-cost plans. I explain the disparate perspectives below. In its 2014 call letter, CMS noted concerns that costs might actually be higher in preferred networks than in non-preferred networks. See Will CMS Crack Down on Part D Preferred Pharmacy Networks? The newly-released CMS analysis explains the basis of these concerns. Based on March 2012 data from 13 Medicare Part D Prescription Drug Plans (PDPs), CMS examined 50 drugs—the top 25 brand drugs and the top 25 generic drugs. CMS computed a weighted unit cost (WUC) for the preferred and non-preferred networks within each contract. Unit cost is defined as the negotiated price (ingredient cost plus dispensing fee) divided by the quantity dispensed. This approach standardizes costs to an equivalent unit, i.e., cost per pill. Claims at preferred pharmacies accounted for about two-thirds of the total. In addition to preferred retail pharmacies, CMS considered all mail pharmacies to be part of a preferred network. Mail claims accounted for only 7% of total claims (and 0% in many plans). Note that CMS looked at 2012 data. The 2013 market for preferred networks is much bigger, per Final 2013 Part D Data: Preferred Pharmacy Networks Still Win Big. For more background, see “The Narrow Network Revolution,” starting on page 115 of the 2012–13 Economic Report on Retail, Mail, and Specialty Pharmacies. Here is my summary re-analysis of the CMS data. 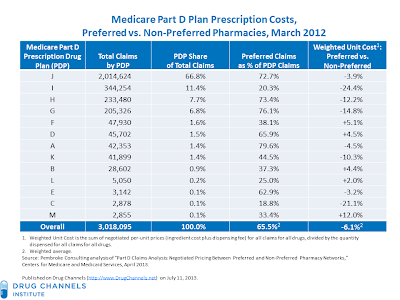 A Part D plan’s prescription costs are 6.1% cheaper at preferred network pharmacies vs. non-preferred pharmacies. In other words, CMS proved the basic premise behind narrow networks. According to table 2 in the CMS report, brand-name prescriptions were 3.3% cheaper, while generic prescriptions were 11% cheaper. Savings were larger at the bigger plans. The top four PDPs accounted for 93% of claims in the CMS sample. Preferred pharmacies offered average discounts of 4% to 24%, with a weighted average WUC discount of 7.9%. Savings from the large plans drove the overall savings figures as well as Table 2’s drug-specific results. Not all small plans were cheaper. 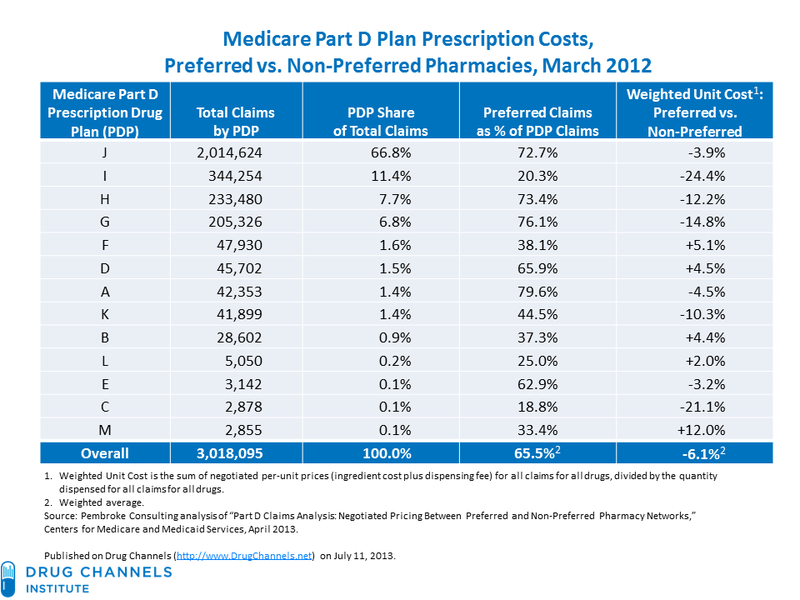 Surprisingly, preferred pharmacy costs were higher in five of the 13 plans (Range: +2.0% to +12.0%). These five plans accounted for only 4% of the CMS sample, so the higher costs didn’t affect the overall results. Following additional CMS data requests, three of these five plans confirmed higher costs in preferred networks. I’m not sure what happened with these plans. Are they just really bad negotiators? However, some small plans were cheaper. In the four remaining plans, preferred pharmacies offered a weighted average WUC discount of 7.7%. 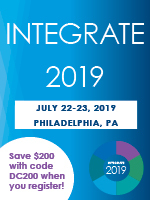 The NCPA, which represents community pharmacy owners, issued its own press release: Medicare Analysis Confirms Some ‘Preferred Pharmacy’ Drug Plans are Costlier to Plan Sponsors than Traditional Benefit Designs. NCPA essentially ignores the overall cost-savings results by emphasizing the five smaller, higher-cost plans. While both press releases describe the same study, the PCMA’s global point is more accurate, because 96% of the claims came from eight plans in which preferred pharmacy networks were less expensive. 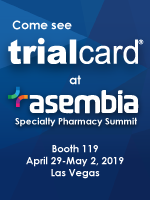 Keep in mind that preferred network savings come from reduced pharmacy margins, because pharmacies compete to be in a payer’s narrower network. So it’s no surprise that pharmacy owners don’t always like these networks. However, the NCPA is right to cite the poor plan management for the five (or three?) Part D plans in which preferred networks were mystifyingly more expensive. As I note in the Drug Channels May news roundup, CMS has already blocked enrollment and marketing in Walgreen’s SmartD Part D plan due to “widespread failures in numerous important operational areas.” Time for further sanctions? Given the 2013 growth in these networks, I expect CMS to update its guidelines regarding preferred networks. However, the cost savings shown in this new report support my view that preferred networks will continue to grow. Personal experience with a Part D preferred network left me scratching my head. The submitted generic retail prices of the plan with the highest percentage of preferred business was two to three times higher than a non-preferred big box competitor's U&C and local independent pharmacies (where by plan design, the copays are much higher). The result is that what should be the cheapest drugs are relatively high (other than those that fall in the $4 retail category), and push the purchaser into the donut-hole much faster. The illusion is that the drugs are inexpensive because the copays are small. It is the adjudicated/returned cost which shows up on the plan report as "plan paid" which is outrageous since it accrues as TRooP. Thus, the perceived savings evaporates for those with higher overall spend for the year, as the donut-hole costs on both generics and brands quickly out-strip the copay savings during the initial coverage period. CMS should take note. You make only passing reference to how the CMS report used data from mail order providers. Yet, in the "Findings" section and in Table 1 of the report, including claims from mail order actually increased the WUC for some of these plans. Thoughts? Yes, I noticed that fact. However, we can't draw any conclusions about mail, because drug mix is different between channels. Note some oddities in the data. 91% of all mail claims came from Plan J, in which retail preferred WUC was actually higher than non-preferred. (?) Mail claims created the 3.9% savings shown above. Also, 7 of the 13 plans had trivial mail usage. AMP Final Rule Delayed to ... January 2014?